I love these two china cabinets (by Drexel Heritage). It makes me want to throw out everything in my formal dining room and add these two cabinets and start from there. I'm not crazy about the pendant lighting at all, and the table is definitely neat (so much so I have one in my breakfast room). I'm ready for a change and these cabinets might be the place to start. I like mixing a formal look with a casual one. Taking these cabinets and adding a great chandelier. I'm still thinking on the table. Lamps, lamps, and more lamps. For me lamps are like bracelets, if one is good then...is better(fill in the blank to fit your room). The lighting is prettier and softer, lamps are beautiful and interesting. I like framing the window with two lamps. I do not like the artificial flowers under the table - ick! Sorry. 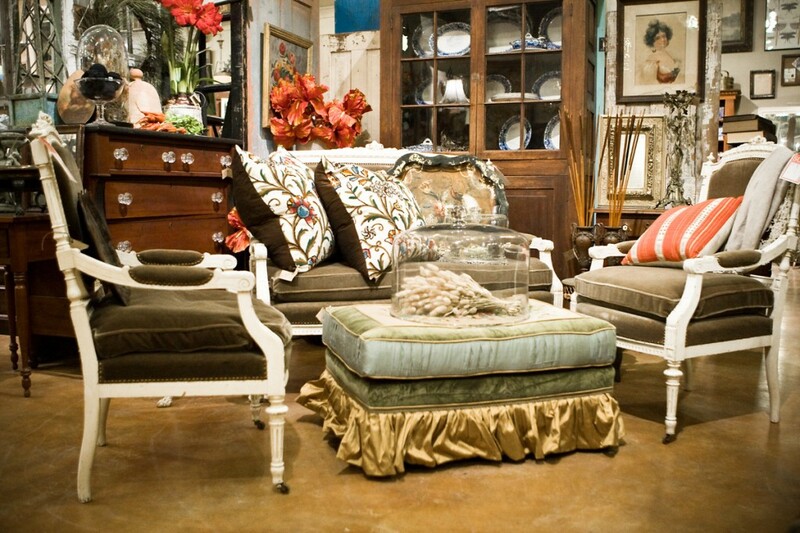 I know the idea is to hide the cords from the lamps, but a sweet little ottoman slip covered would look fabulous. The bed is heavenly and I have white bedding. Above the bed is a grouping of framed Intaglios. A very interesting history behind these if you ever get the chance to read about them. I'm not wild about the look but can appreciate the history and collection. Mirror, mirror on the wall, so it goes. A round mirror is mesmerising. Make it a convex mirror (not in your bathroom) and wonderful. A whole new dimension. The scones are a beautiful touch and smart too, who doesn't want a nice soft glow around their face. Everyone looks better under soft lighting. My focus is the ottoman. I can't look at any thing else. Interesting,plush, lots of details, and I want to put my hands all over it. The chairs are nice to, but REALLY the ottoman is fun! The photo is from Leftovers in Brenham,Texas. A super antique store off Highway 290. What a great blog about the Batten Luncheon. All your pictures are beautiful. I hope Ann sees it. Thanks to all of us for doing a great job. I think all the ladies really enjoyed it!